What does Putin want? This question has vexed Western politicians, strategists, and military officers since the former KGB officer first became Russia’s president in 2000. Since that time, any number of Western pundits have tried to understand the motivations of the most important man in Russia, and more importantly, tried to figure out how to deal with a resurgent Russia determined to re-assert its place in the international order. Angela Stent, a former National Intelligence Officer for Russia, provides a timely and in-depth look at Vladimir Putin’s view of Russia’s place in the world by examining Russia’s ongoing relationships with strategic allies and adversaries. Each country or regional case study begins with an in-depth historical background focused on the Communist and post-Communist eras, especially during the Russian nadir of the 1990s that most influenced Putin’s foreign policy views. Rightly so, the author spends the most time on Russia’s relationship with NATO, Europe, and the United States. Relations are at their most tense since the end of the Cold War, and the NATO alliance members, particularly Germany and the United States, face significant challenges managing the intricate web of economic, military, and political issues presented by a Russia determined to divide Europe and separate America from the Atlantic alliance. The chapter on Putin’s views of NATO expansion in Eastern Europe and the subsequent conflict between Russia and the Ukraine are particularly well done and thought provoking. 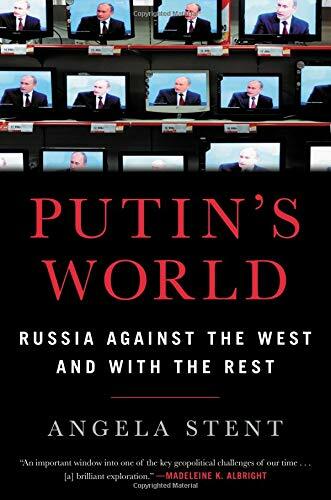 The author seems almost empathetic with Putin’s dark interpretation of the expansion of NATO, particularly in the Baltics, which he views as surrounding Russia with hostile powers and removing the former buffer of the Warsaw Pact to an imagined attack by NATO. Combined with Putin’s view of an immutable sphere of influence Russia is entitled to over Belarus and Ukraine, and the reader gets a much better understanding of Putin’s motivation for seizing Crimea in 2104 by a coup de main and why Russia continues to expend blood and treasure in the “frozen conflict” of Eastern Ukraine. Beyond Europe, the author highlights how Russia continues to exert an outsized influence in the Middle East by maintaining relations with nearly every stakeholder in the region, even between adversaries such as the Israelis and Iranians and the Syrians and Turks. The intervention of Russian airpower, special forces, and state-sponsored mercenaries to bolster the Assad regime in Syria was a watershed moment for Putin and the likely success of that mission has greatly increased Russia’s prestige in the region. Putin’s desire for Russia to have a seat at the table for any negations on the future of Syria have been realized, and the subsequent close relationship between Russia, Turkey, and Iran has caused concern in both the region and Europe, where Turkey is still a member of NATO. Whether Russia can manage its occasionally contentious relationships within this seemingly intractable region remains to be seen. Finally, the author examines the most critical of Russia’s relationships, at least from the perspective of the U.S.—its new-found rapprochement with China. Russia’s relationship with its colossus to the south has historically been more challenging than its interactions with Europe. Even during the Cold War era, the two Communist powers came very close to nuclear war over a Siberian border dispute in the late 1960s. For the moment, this new entente is clearly focused on diminishing the influence of the United States and reshaping the current international order to be more amenable to their goals and interests. However, the author notes their latent historical mistrust, particularly now that China has a vastly more diverse and growing economy and increasingly capable military, makes this more likely a temporary alliance of convenience rather than a long-term relationship. The book does not offer any sort of upbeat prognosis. An interesting point raised by the author is that Russia has no real allies, relying on a series of bilateral relationships or one-sided alliances of mutual, although often fleeting interests, since Russia desires to be the senior player in nearly all arrangements. Another critical factor is the potential successor to Putin, who is currently constitutionally term-limited to 2024. Putin’s cult of personality and extreme centralization of power, which has reached Stalinesque proportions, make the question of whether Putin will truly step down and who might actually succeed him a major riddle for Russia watchers. In addition, no matter how well Putin manages Russia’s current military and diplomatic efforts, the continued demographic issues Russia faces, combined with an economy still dependent primarily on oil and gas exports and crippled by Western sanctions, make Russia’s current situation probably untenable in the long term. While Russia may remain a military superpower due to its nuclear arsenal, its ability to maintain that power with a stagnant economy and internal domestic issues in a post-Putin era remains in doubt. The strategic challenge posed by a resurgent, but fragile Russia are driven almost exclusively by Vladimir Putin and this volume offers an excellent starting point for understanding how Putin intends to take on the world.